Blackjack could seem to be rather simple card game at the first sight, but you would undervalue it essentially if consider that the main difficulty of blackjack is not to exceed the upper limit of 21 points. There are some blackjack strategies that might help players to decrease the house advantage or even convert blackjack house odds into their own but only provided that they are applied correctly. 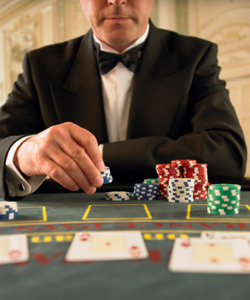 Nevertheless, if you are really eager to use sophisticated playing systems, the first thing you should know by heart are basic rules of blackjack. Although, there are a lot of game's variations with their inherent sets of regulations, some common blackjack features exist. Blackjack is played with usual decks of cards (from 1 to 8) and each card implies a certain number of points. Players should know blackjack card values by heart in order to adopt their actions according to constantly changing playing situation. Blackjack is a game of skill, so it is necessary to learn blackjack basic strategy for satisfactory game results. If you search just for entertainment and pleasant time spending while gambling blackjack, this knowledge would be enough, while in case of serious and prestigious blackjack game it is considered as obligatory to know how blackjack card counting works. The main goal of goal of blackjack is finish the game with a higher value of cards than the dealer has, but lower than the upper boundary of 21 points. It is worth to remember that blackjack in the sense of card combination is considered only in case if you have an ace in your initial card combination while any other set of cards, which gives in total 21 points but does not contain any aces, would not be regarded as blackjack. In addition, if players split two aces and then add 10 points valued card to one of them, such combination is not considered blackjack also. The distinctions between the cards, which are worth 21 points, and natural is important because in the latter case you get higher payoff of 3-2.
the last situation when both dealer and player have natural, the final result - tie or push - is usually dependent on casino's rules of blackjack.